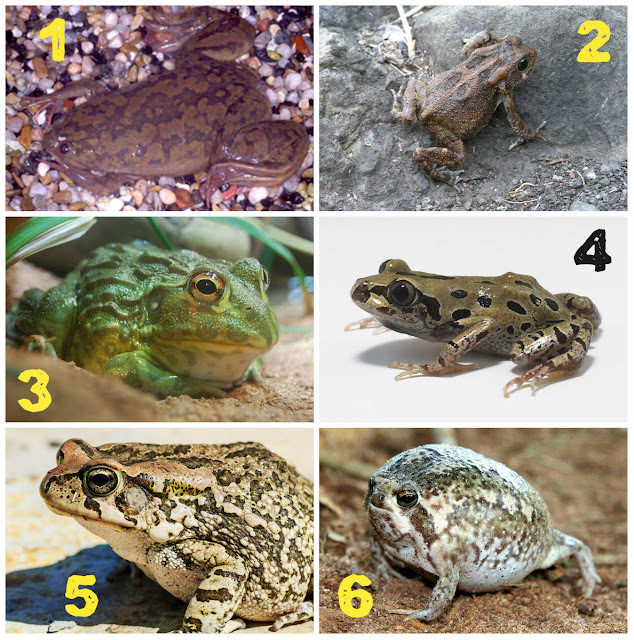 Some characteristics of amphibians: ectothermic, glandular skin, breathing throuh porous skin, only amphibian representative in South Africa is the order Anura. Advertissement calls: only in breeding season. Males call together in the breeding site. Calls made to advertise to females they are there, to attract them to mate. Agressive calls: early in the evening at the onset. If space between males breakdown, if they get too close to each other, physical combat may start up and agressive calls uttered until one male is displaced by the other. Release calls: Males clsp both females and other males, try to mate with any other frog. If the other is not ready, it expels air from the lungs in short bursts causing vibration of its sides.Inform amplexing male that amplexus is quickly ended. Distress calls: with mouth open, produced when a frog is seized by a predator. May aid escape by alarming a mammalian or avian predator and other individuals to the presence of danger. 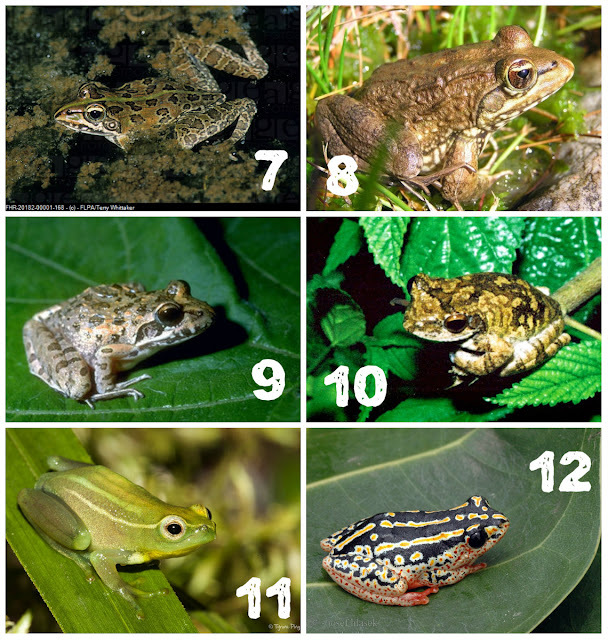 Frog satellite behaviour: silent males are close to calling males. Then intercept females attracted by call. Time-share calling: dense breeding chorus at night by males, help females to find males. Amplexus: it is when the male clspq the female to mate with her. Axillary clasp: male straddles the female's back. Inguinal clasp: occurs in primitive aquatic families that mate in water (platannas). Male clasps the female around the waist. Eggs pass over the underside of the male and over his cloaca (mating organ). Adhesion: by the rain frogs where the male becomes glued to the female for the duration of the fertilization process. Females lays eggs and male deposits his sperm over them. The fertilization is external so the eggs and the spermatozoa need to be deposited in close proximity to ensure a high frequency of fertilization, because the life of a spermatozoa in fresh water is short. In many species, male positions his feet over the cloaca of the female at the moment of egg release and funnels his seminal fluid down between his feet and over eggs to ensure fertilization. The main part of egg consists of food reserves (protein and fat). It provides nourishment for the developping embryo until they hatch, after which the tadpoles feed independently. The eggs are covered in a sticky jelly-like substance. They may be deposited in strings, clusters or in rafts. It keeps the eggs attracted to objects, gives a concealment by allowing particles of dirt to stick making them less visible by the predators. It reduce the danger of damage to the embryo and is used as glue to construct nests. It also contains antibiotic preventing fungal and bacterial growth. The upper half of egg is more darktly pigmented than the lower half. It enables eggs to be distinguished from predators. When looking on top, it blends in with the dark colour of bottom of the water body. When looking on bottom, it blends in with the light background of the sky. The majority of South African frogs deposit eggs in open water and do not construct nest. Some construct nests in low vegetation or in tree overhanging water from which the tadpoles hatch and move to water (foam nest frogs). Some carry their eggs up until the advanced tadpoles are release into water by adult (mottled shovel-nosed frog). Some construct nests in moss, under logs or burrows. These frogs have no aquatic larval stage (rainfrog). 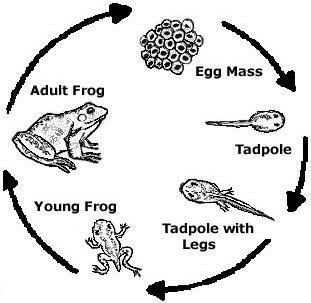 The lenght of time for the tadpoles to develop into froglets varies between species, depends on temperature, available food and type of water body. Generally, tadpole life last for about 4 to 12 weeks but may be as long as 2 years among species that breeds in permanent water. The tadpoles structure like the tail, folds, gills, larval mouthparts are lost. The new structures are lungs, limbs, eardrums, tongue, eyelids, cornified skin. It is the transition to air breathing from gill breathing; herbivore to carnivore (insects). Froglets are vulnerable, not well-adapted to life on land or in water, and are then easily eaten by predators. 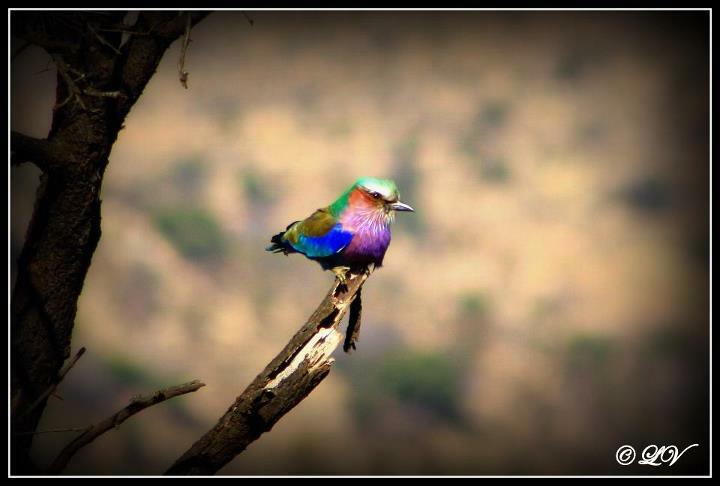 Some species are able to change colour to suit their surrounding environment. When the pigment is dispersed throughout the cells the skin colour darkens. When the pigment is condensed within the cells into compact masses the skin colour lightens. The colour change is a response to a light intensity, the temperature, the background colour and the emotional state of the individual. Cryptic colouration: concealment useful to avoid predator and to be a predator. Frogs matche skin colour of the background, the colour pattern with environmental patterns by displaying longitudinal striping, banding, blotching. Flash colouration: When a frog is at rest, a bright colour to scare the predators. Aposematic colouration: it is to warm predators that they are poisonous, that they have an undesirable taste (banded rubber frog). Thermoregulatory colouration: If surrounding temperature is hot , the darker the frog is. The lighter the frog is, the more light will be reflected thereby reducing the temperature. It is possible for a frog to control over its temperature through a change in colour (reed frog). Adults are carnivores, feeding mainly on live preys. The tongue is very well developed. The glands in the mouth produce a sticky secretion over the tongue that helps to transfer the food. Frog ficks its tongue forwards and out of the mouth, the prey is brought back into mouth and swallowed whole. Usually frogs sit and wait for the prey to come. They are opportunistic and unselective. Why they are good indicators of conditions of the environment? They spend part of their life cycle on land and water. They have a permeable skin, which allow the substances to move into its body, absorb and concentrate toxins in its tissues. They are very susceptible to chemical contamination so they can alert us to the problems in our environment.